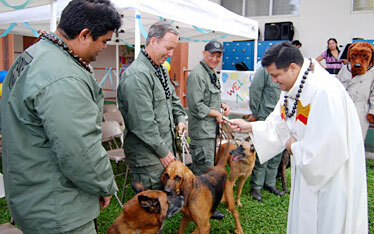 Father Robert Ballecer blessed members of the Honolulu Police Department's canine unit during yesterday's Saint Francis School Feast Day Celebration of St. Francis of Assisi. Holding the dogs were officers Paul Vargas, left, with Max; John Hall, with Annie; and Dean Suzuki, with Rocky. 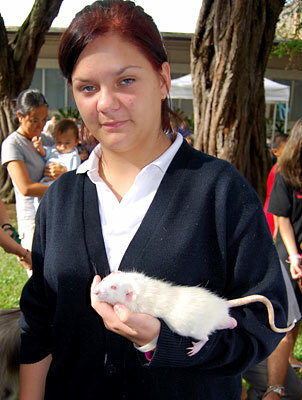 Eva Tate Reierson, with her pet white rat, also attended yesterday's blessing at St. Francis School. 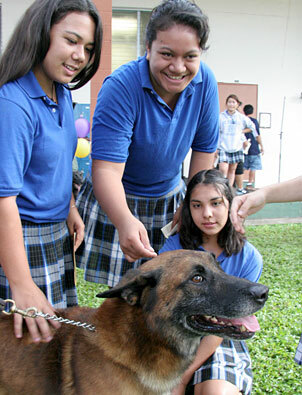 Kalena Snow and Manino Laeli were among the students who got to pet the police dog Max. 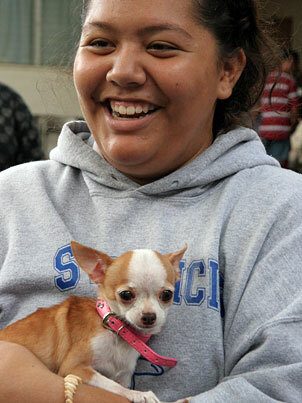 Shelby Burns held Maka, a pet owned by classmate Shivanni Stephenson.